Come one and come all! Step right up and see the most famous dynamic duo on the planet: It’s C.J. and Touche! 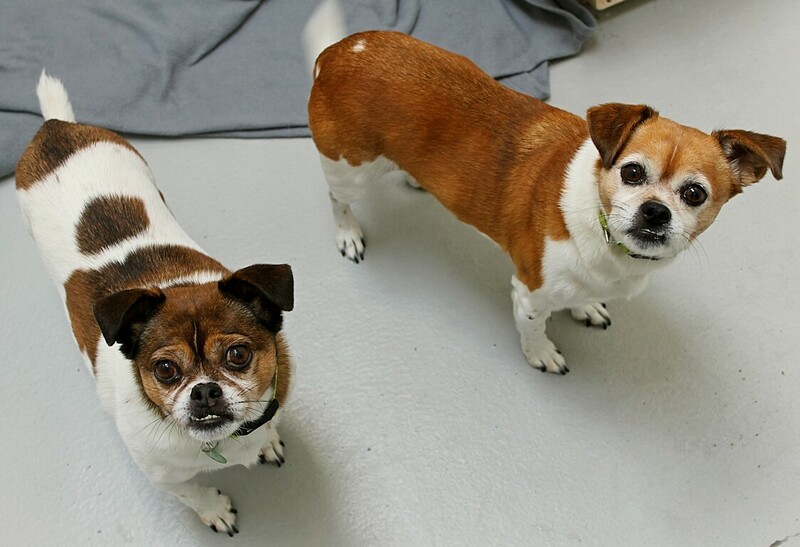 We are a couple of 9 year old adorable Pug/Terrier mixes both weighing in at around 14lbs. We have been together all our lives and never go anywhere with out the other, so suffice to say we are indeed bonded. We unfortunately lost our mom who recently passed away in hospice care. But we are very social with other people and would be oh so happy to be apart of a family again. In this 3 ringed circus known as life, we have met a lot of other dogs and people in our travels, but we would much prefer to retire in a quiet adult only owned home as the only pets. We are still very playful both with each other and with our human friends too! We would love a nice little yard to run around in and play some fetch. And at the end of the night, we of course are ready to snuggle in close with you on the couch as we watch some of our favorite Netflix shows. Overall, we were just adorable, hilarious, and sweet pups with the cutest underbites that will make anyone say “awww!”. So fill out an application today! Available for foster or adoption, we come to you spayed (touche) and neutered (CJ), micro-chipped, vaccinated with a recent dental and an adoption fee of $350.